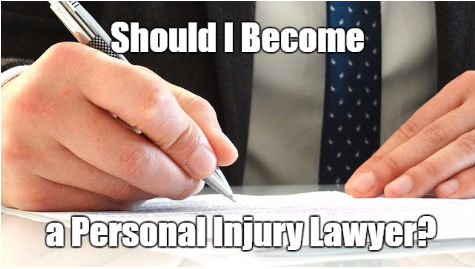 Home → Business → Should I Become a Personal Injury Lawyer? Some young lawyers begin practicing personal injury law straight out of law school. They probably clerked for a plaintiff firm when they were studying law and passed the bar exam. Now they’re sitting at the same desk that they sat at when they were law clerks. What distinguishes their old job from their new job is that they’re licensed to practice law now. They can sign their own pleadings and motions, and they stand in court and argue them. Others are already lawyers, and they phase into personal injury law from another area of practice. A quality personal injury practice can be very lucrative. It’s safe to say that 90 percent of all graduating law students don’t graduate in the top 10 percent of their class. That fact makes it difficult for a young attorney to get into the door of a quality personal injury practice. For many attorneys, working his or her way through law school interfered with the ability to increase that sacred grade point average and class rank. Couple that with the lack of any experience standing on their feet in a courtroom and arguing an issue in a complex personal injury case. Even if the judge rules in favor of that young lawyer, the school of hard knocks wins again, but that’s how hungry young lawyers become good at what they do. They just didn’t have some of the opportunities that some other law students had. Criminal lawyers get nearly all of the publicity from the media. A good personal injury lawyer doesn’t get that publicity, nor does he or she need it while quietly earning considerably more money than nearly all criminal lawyers. An ordinary American county is unlikely to find an attorney who focuses on criminal law who makes $100,000 or more on a single case. A quality personal injury lawyer might have the pipeline running with those on a fairly frequent basis. After those are the occasional seven figure cases. The experience of the criminal law attorney is the advantage over the young lawyer who wants to develop a personal injury practice. The young lawyer might get retained on some accident cases, but he or she will have to wait to get paid. That’s due to contingency fees. Personal injury lawyers are not going to get paid until such time as they have obtained a settlement or verdict for their client. If you want to open your own personal injury office, the wait for that first check can be very long, and there are personal and professional bills to pay in the interim. The time line from the date of being retained to the date of settlement or verdict can easily be two years in a case involving severe injuries. On the other hand, the criminal law attorney already has at least cultivated somewhat of a practice, has stood on his or her feet in front of juries, and can rely on income from their practice while phasing into personal injury law. That lawyer has already been to the school of hard knocks. The criminal lawyer’s experience makes for a more comfortable transition into a personal injury practice. Aside from the financial benefits, personal injury lawyers continually meet new people and develop new relationships. They’re challenged to learn as new law develops. Their profession is also coupled with anatomy, physiology and medicine, so their constant engagement in learning isn’t only involved with the law. They meet people who are having difficult periods in the time lines of their lives, and they’ able to help them put their lives and families back together. Personal injury lawyers learn about risk versus reward very quickly because they’re subsidizing the costs of their clients’ cases with their own cash. If they lose, they don’t get paid either. One good personal injury lawyer can cause a Fortune 500 company considerable financial pain. They seek justice for injured clients and the families of those who died as a result of the carelessness and negligence of somebody else. Many personal injury lawyers don’t solicit clients or have advertisements on the sides of buses. They don’t have to do that because other less qualified lawyers and satisfied clients refer them cases. There can be a great sense of personal and professional satisfaction in being a personal injury lawyer, and the income involved can make somebody a considerable amount of money over a career. Thank you Chris. Outstanding insight, as always.